501 See (3) You Later? 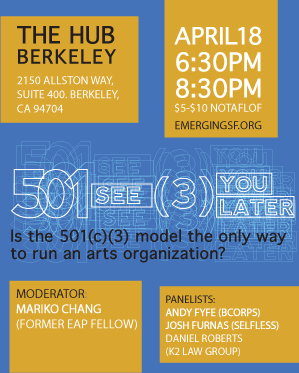 Is the 501(c)(3) model the only way to run an arts organization? Arts and culture organizations face greater challenges as traditional arts funding decreases and philanthropic needs shift rapidly. Join us to learn about new financial models including benefit corporations (B corps), low-profit limited liability corporations (L3Cs) , and the emerging economy of social enterprises and impact investing. 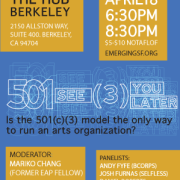 Experts from the field will teach you essential information on each of these new financial models while you mingle with arts, culture, and business workers from across the Bay Area region. We will conclude the evening with a fun arts prototyping activity giving you the opportunity to make a creative enterprise using one of the new financial models. Get your ticket now on Eventbrite.